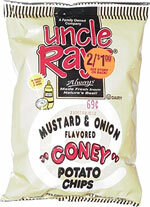 Taste test: These taste like your typical hot dog toppings  a mild mustard taste, with some onion mixed in. They're pretty good chips, with a good amount of flavoring, as the flavoring overpowers the potato taste and covers up any greasy potato taste. They're kind of addictive.  it's hard to stop eating them. This small 2-oz. bag had a generous helping of chips. Smell test: Smells like hot dog toppings. This snack was discovered by Jeremy at Lambert's Rainbow Square, Westwood, Massachusetts. Review published .